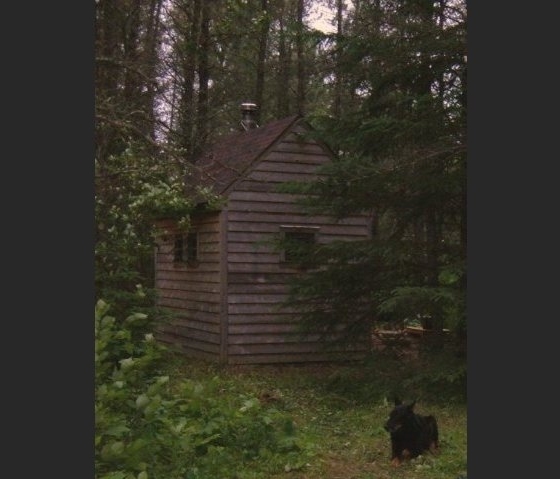 At my cabin in the north woods of Minnesota, I woke up one morning in late May to the most enchanting bird song I had ever heard. I listened for a long while to what I thought was one bird singing. Then I hiked into the woods with my dog to try to spot this beautiful singer. I entered into a surreal world: There in a beautiful hollow of the woods, flooded with strong shafts of morning sun in the perfect stillness, were many of these singers, not only taking turns singing, but also darting through the hollow with unbelievable swiftness, sometimes in pairs, sometimes as singles. It was clearly mating season for these incredible creatures who paid no mind at all to my large dog or me standing right in their flight path through the hollow. The whole scene transported me to what I imagined medieval times to be like. I eventually got a good look at one in a pine tree branch with my binoculars (they are very hard to spot), and eventually learned that they are hermit thrushes. I've since learned that these birds are, not surprisingly, widely regarded as the world's most beautiful singers. I returned to my cabin a few days later to record them. Mating season was over along with the most consistently beautiful singing, but I still managed to capture hours of very good singing. They sing almost steadily from before sunrise until after sunset, with the bulk of the singing coming early and late in the day. The song of the hermit thrush is generally considered to be the finest heard in our northern woodlands. ... none can match the sweetness and aesthetic appeal of this bird's pure, silvery, fluted notes. Its song is perhaps most inspiring when twilight's stillness encompasses the woods in springtime, but it must be heard at fairly close range to appreciate all of the minor notes." Then in the depths of the forest, perhaps near at hand, perhaps far away, a single hermit thrush began to sing. His song was of three solemn deep liquid notes; followed by a slight rhetorical pause as of contemplation; and then, deliberately, three notes more on a different key--and so on without haste and without pause. It is the most dignified, the most spiritual, the holiest of woods utterances. Combined with the evening shadows and the warm soft air, it offered to the heart an almost irresistible appeal. Named for its shy, retiring ways, the hermit thrush can be found in mixed woodlands all across North America. If you encounter a hermit thrush in the woods, watch for it to fly to a convenient perch from which it will watch you, scolding with a soft tschupp. 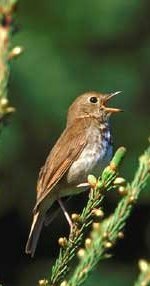 The full song of the hermit thrush is a beautiful series of flutelike notes repeated on different tones. Because it is soft and given from deep in the woods, the hermit's song is often overlooked. The ethereal flute-like song of the Hermit Thrush, heard rarely in winter and not at all during migration, is sung from the tops of trees or standing dead snags by males beginning as much as an hour before sunrise, and ending 30 or 40 minutes after sunset. The song begins with a clear whistled note followed by three or more descending phrases that are usually pitched higher than the initial note. This pattern is repeated after a pause, but at a different pitch. The effect is of a theme with variations in different keys and has invited comparisons to human musical compositions. Phonetically, it may be rendered as oh- holy, holy, holy; ah- purity, purity, purity; eeh- sweetly, sweetly, sweetly. The final notes of each repetition are usually pitched higher and weaker, producing an echo-like effect. The Hermit Thrush is the only one of the brown-backed thrushes that winters in North America. 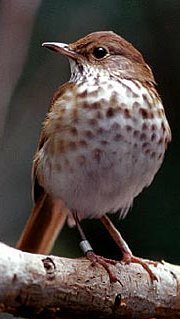 The Veery (Catharus fuscescens), Gray-cheeked Thrush (C. minimus), Bicknell's Thrush (C. bicknelli), Swainson's Thrush (C. ustulatus), and Wood Thrush (Hylocichla mustelina) all migrate to spend the winter in Central or South America. Although seemingly hardier than these other thrushes and occasionally recorded in winter well north of its normal range, Hermit Thrushes may still succumb to sudden cold snaps and to heavy snowfall that covers their food sources. These thrushes are common in winter only where the average January temperature is above 30 degrees Fahrenheit and where there is a supply of open water. Hermit Thrushes winter most abundantly in the river valleys of the southeastern United States and in the Coast Range of the Pacific states. In the mountains of the West, they retreat from the higher altitudes in winter and similarly avoid the higher Appalachian peaks in their southeastern winter range. In the fall they are typically the last thrush to migrate, and in spring they are the first to return to the breeding range. Males arrive before females and establish territories. When the females arrive, they are treated at first as intruders by males but are compelled to stay because of the male's singing. The ethereal flute-like song of the Hermit Thrush, heard rarely in winter and not at all during migration, is sung from the tops of trees or standing dead snags by males beginning as much as an hour before sunrise, and ending 30 or 40 minutes after sunset. The song begins with a clear whistled note followed by three or more descending phrases that are usually pitched higher than the initial note. This pattern is repeated after a pause, but at a different pitch. The effect is of a theme with variations in different keys and has invited comparisons to human musical compositions. Phonetically, it may be rendered as oh- holy, holy, holy; ah- purity, purity, purity; eeh- sweetly, sweetly, sweetly. The final notes of each repetition are usually pitched higher and weaker, producing an echo-like effect. Hermit Thrushes also give a blackbirdlike call note that may be repeated two or three times as tchup, chup, chup and a nasal towheelike upslurred weeeh. Compared to other Catharus thrushes, the Hermit Thrush uses a broad array of forest and edge habitats. It is a bird of the forest interior, but it is most often found in the edge habitats that occur there, such as the margins of ponds or bogs, small clearings created by disturbances, or utility cuts and roads. Like the Wood Thrush or American Robin, it forages on the forest floor but probes less for soil invertebrates than either of the other two. More so than other thrushes, it will sally into the air after flying insects. During the breeding season, more than 90 percent of its food is made up of insects, spiders, and other animals. Fruits and berries are more important in winter, when such vegetable food makes up approximately half of the Hermit Thrush's diet.